Most people consider running one marathon to be a feat. Brooke Curran is two years into her pledge to run a marathon in all 50 states, on all seven continents (yes, even Antarctica) and to finish each of the five world marathon majors in five years. Mrs. Curran doesn’t just train and run for her own sake. She uses her passion to support women’s and children’s organizations in her hometown of Alexandria, Va. A longtime runner, the mother of three and member of the Eleanor Wilson Chapter, Washington, D.C., remembers when she was first inspired by the idea of running for charity. She recalls driving through one of Alexandria’s run-down areas—a neighborhood she frequently passed through on her way home. Usually, she would look around for a moment and feel badly for her neighbors, then a mile down the road she forgot about them. So she decided to make it about someone else. “I figured if I could commit to something so audacious, then I could ask my friends and family for donations,” she says. In 2009, she raised $20,000 for the Child and Family Network Centers, which provides free preschool and social services for at-risk children and their families. In 2010, she channeled more than $30,000 to area nonprofits. This year, her goal is to raise $50,000, which will support five local organizations. These include Girls on the Run, which encourages healthy living and boosts self-esteem through running, and The Reading Connection, a group that promotes literacy among disadvantaged kids. Mrs. Curran pays for her own race fees and travel arrangements, enabling all money raised to go to charity. Since 2009, Mrs. Curran has finished 30 marathons. Running in China last May and among the giant stone heads of Easter Island the year before are top contenders for favorite races. 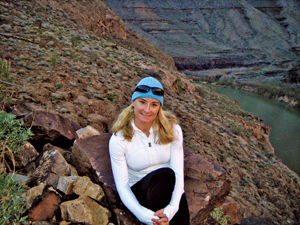 Stateside she counts Anchorage, Alaska, as well as Raleigh, N.C., among her most memorable marathons. This month, she’s participating in the Big Sur International Marathon in Big Sur, Calif., and next month she’ll be in West Virginia. Then it’s back out west to Wyoming in July. Next spring she’s headed to Antarctica for one of only two footraces held on the continent. She’s looking forward to it, though she admits, “It does scare me a little bit.” Mrs. Curran suffers from exercise-induced asthma that worsens in cold weather, and she also gets seasick—traveling to Antarctica involves a boat and some of the roughest waters in the world. While her husband, Chris, and three teenage daughters Clare, Kate and Caroline sometimes travel (and race) with Mrs. Curran, they won’t be making the two-week trip with her to Antarctica. “My philosophy is if you’re coming, you’re running,” she jokes. When she’s not running or training, she manages the RunningBrooke Fund (www.runningbrooke.com). “I’m working up to six hours a day trying to propel this forward,” she says. Next on her to-do list is to secure some national sponsors. “I’m always coming up with new ways to raise money and make a difference,” she says.